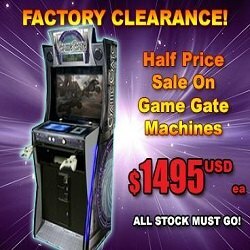 Game Gate VU Cabinets On Sale - Save 50% Off! The Game Gate VU arcade-style cabinet is a revolutionary coin-operated machine that uses home market hardware to give players more gaming options in a single cabinet than ever before and is now on sale - save over 50% off! The Game Gate VU is compatible with Xbox 360 and Xbox Kinect consoles, allowing you to use home market technology in a old-school arcade style cabinet. It has been greatly transformed since it first entered the market with firmware and software improvements increasing the reliability and stability of the machine. It features a 32" high-definition LCD monitor with built-in subwoofer, and is housed in a sleek upright cabinet to help maximize floor space, and can play hundreds of Xbox 360 and Kinect video games. Furthermore, the Game Gate VU includes a coin mechanism which can be programmed to accept either coins or tokens. Lastly, the machines can be linked locally for exciting LAN play, or connected to the internet for online play (based on internet connection and game system used). The Game Gate also has two Xbox 360 memory card jacks on the front of the unit which allow players to load/save game data and load gamer profile for network play. This cabinet is great for home games rooms, kids rooms, man caves, party rooms, staff rooms, common areas, waiting rooms, offices - anywhere you can think of and is fun for game enthusiasts of all ages! Game Gate VU machines are ready for immediate shipment ex-USA. Please contact us for more information, or if you would like to place an order, but hurry as stocks are limited!